Many car manufacturers have made bold commitments to reduce carbon emissions. Last week, an estimated 1.5 million students from more than 100 countries walked out of schools and into the streets to protest the lack of climate action being taken by their leaders. The efforts of these students are mirrored by growing public concern over the state of the climate and our planet’s future. In a recent survey, over 69% of Americans said they were “somewhat concerned” over climate change, with 29% saying they were “very worried”. These are the highest levels of concern measured by the poll since it began in 2008. Increasing climate concern is matched by increasing pressure on carbon emitters to change the way they do business. The transport sector accounts for 24% of CO2 emissions globally. Transport is the largest CO2 emitter in the US, accounting for 28% of emissions, though the energy sector is not far behind. What have car-makers done so far? Early green initiatives by the automotive industry, such as "clean diesel" cars, proved to be misleading. But despite past shortcomings, car-makers have recently made dramatic changes to their operations in pursuit of sustainability. Many manufacturers have made bold commitments to reduce carbon emissions, while also expanding the scope and style of their electric vehicles (EVs). Porsche has committed to electrifying over half its cars by 2025. Volkswagen has announced plans to reduce the average emissions of its new vehicles by 30% by 2025, and is aiming to be carbon neutral by 2050. Car-makers have also undertaken more technical, but equally dramatic, changes. For over a century, nearly all vehicles have been driven by the same combination of an internal combustion engine mated to a mechanical transmission. But electric vehicles are based on a fundamentally different platform, consisting of a large battery and electric motors driving the wheels. This transformation of the basic powertrain in the car requires huge operational shifts. And many car-makers are making this transformation in just one product generation. There are presently very few electric cars on the road. Less than 2% of cars in the US are electric. EV rates are similar throughout Europe, and other regions come in even lower. 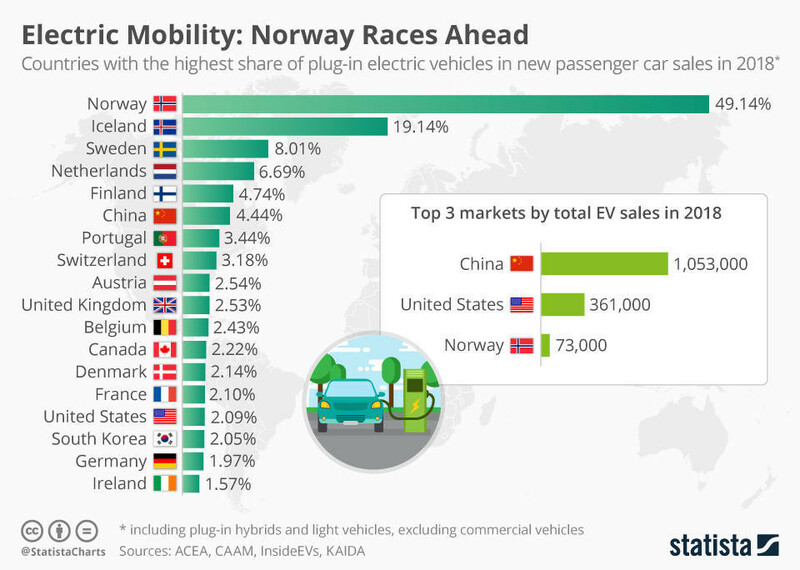 The few countries with higher EV rates, such as Norway, have relied on large government incentives to boost sales. Many experts believe low demand to be a key factor inhibiting the transition to EVs. “The incentives you have to put on electric vehicles to move them pose a real commercial challenge”, says Eric Jillard, Head of the Automotive Industry at the World Economic Forum. Focusing on the following three areas could help drive demand for EVs, Jillard believes. Despite climate concerns, many consumers are still very apprehensive when it comes to purchasing a car they have to charge. When the UK surveyed drivers in 2016, 45% of respondents said the availability of chargers was a reason to not buy an electric car. Only 28% said it was the cost of EVs that was prohibitive. Focusing on making high-use vehicles fully electric, such as fleets of taxis, delivery vehicles and mail trucks, is a possible solution. The rationale is simple: if the most-used vehicles are electric, proper charging infrastructure must follow. Unfortunately, installing more chargers will not drive demand alone. Energy grid stability is another concern with increasing numbers of EVs. Once 15% of cars on the road are electric, power grids will be hurt. To accelerate the use of EVs, utilities must change the way they deliver power to their customers.